We carry a wide range of kegerators which can be customized to fulfill you wildest home draft system. Visit our showroom to see and touch these units and many more. We can help you select the perfect model for your home. Hosting a party has never been easier and more fun than with this ultimate freestanding keg cooler by Danby. This model comes with a 5.2 cubic-foot (146 litres) capacity, it’s environmentally friendly as it runs on R134A refrigerant and has an automatic defrosting system for hassle-free maintenance. The magnificent unit includes a CO2 tank as well as all of the required hardware and a precise mechanical-temperature control function. The attractive spotless-steel finish resembles stainless-steel but is much easier to keep clean as is the scratch-resistant worktop. Also included with this versatile keg cooler are a removable drip tray, a black/chrome beer tower dispenser and chrome guard rail. It has an innovative reversible door hinge which allows you to adjust it for either left or right-handed opening and the convenient heavy-duty castors allow for easy portability. The appliance comes with a 12-month warranty on parts and labor with carry-in service. The Beverage-Air BM23 Kegerator provides mobility with utility for home, club, or hospitality. 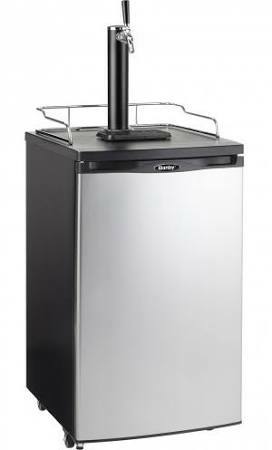 This draft beer refrigerator o ffers a full beer keg capacity, is heavy-duty and has forced air refrigeration & draft beer is dispensed ice cold every time. The BM23 kegerator comes in 2 models, the Standard Model and the Club Top Model. Both models are available in 2 finishes: Black Vinyl and Stainless Steel. Standard construction includes wear resistant vinyl on steel exteriors with black the most popular vinyl choice. Top is made from heavy-duty stainless steel including built-in drip tray for easy cleaning. Top rail is standard on all models. Inside construction utilizes galvanized steel for walls and ceiling. Reinforced floors and doorsills are made from heavy-duty stainless steel to provide lasting service. Door is self-closing with key lock. Magnetic gasket provides positive door sealing. Cabinet insulation is foamed-in-place moisture resistant polyurethane (CFC free) foam which binds the exterior walls with the interior walls to form solid construction and provide unsurpassed insulation. Lift-out heavy duty forced-air refrigeration system creates a steady flow of cold air through the complete product load and provides fast uniform recovery and cooling. Refrigerant used is R134a, which is CFC-free for full compliance to all environmental concerns. A 6′ cord and grounded plug are provided for electrical connection. There are many more models to choose from and priced for every budget. Please visit our store to see these models up close and we would be happy to answer all your questions.